A website is an essential part to any company. If you do not have a website or if your site does not generate any traffic, you are missing out on a potentially large source of company profits. Even if you have a company site that receives many visitors, you still could be missing out on many customers that would be willing to buy from you, but have not seen your website. This article is a summary of how to improve your website rankings and presence so that you can maximize your profits. Whether you are a distributor, a label vendor, or just an ordinary person who stumbled upon this article, I hope that this article will guide you on your way towards developing a strong, profitable company website. The first step to upgrading a company's web presence is to get a website (kind of a given). If you already have a company website, feel free to skip to the next section. The two parts involved in getting a website are purchasing a domain and purchasing a hosting service. Purchasing a domain: In my experience, the best place to buy a domain is Go Daddy. There are other options such as domain.com and active-domain.com, but I have never had any issues with Go Daddy. You can also usually purchase a domain through the hosting company that you choose. Expect to pay $11.99 for a dot com domain. 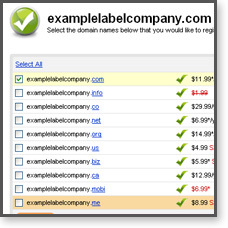 When choosing a domain name, make sure to use your company name with no dashes and make sure to purchase the .com version (the .net, .org, .info, and other extensions are all cheaper for a reason). If your company's name is not available, use your name followed by your main product or product category. For example, if "idimages.com" was taken we would go with "idimageslabels.com." Do not remove vowels, alter the spelling, or do anything that will make the domain name hard to remember or hard to type. This is beneficial later when trying to increase traffic to your site. Most importantly, choose a domain name that is no longer than 3 or 4 words. If you choose "abccompanypackagingproductsandlabels.com" no one will remember it, it will be a pain to type, and it won't fit nicely on a business card (not to mention it will make for some long company email addresses). Purchasing a hosting service: In order for a website to run, it must be hosted somewhere. There are many different hosting options, but I would choose InMotion for hosting a company website. They were rated the best for business class hosting and they have excellent customer service, low hosting prices, and they offer a free domain with a year's hosting. Make sure to choose a business class hosting plan as opposed to a personal hosting plan for your company. Keep it professional: Your website is the face of your company. More people will have an image of your company from your website than from other sources, so you want that image to be a strong, professional image. To achieve this choose 2 or 3 colors to use as a color scheme throughout your website. If your website does not have a color scheme, you can use Adobe's kuler tool to help you choose one. I would recommend using complementary colors, or using shades of grey with one accent color. I would also recommend using at least one of your company's colors as a main color on your website. For our website, I chose grays and red to reflect our logo. Simplicity and consistency of color will give your website a more professional look. Websites that use many bright colors, animated GIFs, scrolling marquee text boxes, and pop up welcome boxes do not look professional. 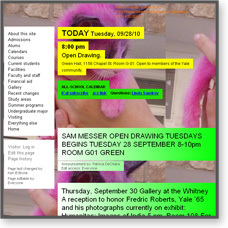 A point to remember is that if your website looks like it belongs in the nineties, it will not be taken seriously by visitors. Keep navigation simple: Some of the best company websites just have simple text links across the top of the page for navigation. This makes it extremely easy for users to find what they are looking for. If you use Flash or a fancy script you may confuse or annoy visitors. Use a simple text-based navigation or use a dhtml drop down menu for your navigation. Also, keep your navigation either on the top or the left side of the page and keep the navigation consistent on every page of the website. Use links logically within the body of your page. Always think "If I were visiting my site for the first time, would I understand how to navigate it?" Give visitors a clear path to follow: The majority of our customers' websites fail in this regard. How can you expect to keep visitors and sell products if you don't give them a clear path? Remember, our attention spans are very short, so if visitors do not find what they are looking for in a second or two they will leave. Use a hierarchy system to sort information from most important to least important. Using a large picture of a product that links to your product pages will keep more visitors than if you just have a large paragraph of text with a link in the middle of it. 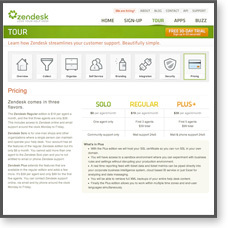 Organize information in the most logical fashion possible to keep from confusing visitors. If you over clutter your pages and do not use visual hierarchy of information, you will just confuse and bore your visitors, which will probably cause them to leave. Also remember that readers scan text. Put the most important information at the beginning and end of paragraphs (I bet that you read that sentence). Give visitors what they want: Along the same lines as the above point, make sure to create your website to meet the needs of your customers. Instead of taking up the whole home page ranting about your company, put in information that your customers need (such as links to product pages, simple contact information, FAQs, prices, etc.). The website is for the customers, not for the company. Most visitors will not be interested in reading a company bio on the home page, but will be interested in clicking on a link to a product that they need. If you follow those tips, you should be able to keep more visitors and be on your way towards improving your company's presence on the web. The next section deals with increasing your website's ranking, which in turn will bring in more visitors, and hopefully more customers. Once your website looks good, is usable, and can keep a visitor's attention for more than a few seconds, the next step is to increase your web traffic. The one way to increase your website's traffic for the long term is through search engine optimization. Search engine optimization (or SEO) is the procedure of increasing your website's traffic through techniques that increase your natural ranking on search engines such as Google. In other words, SEO is using techniques to increase your rank on Google. This does not refer to the paid search results that appear on the side and top of the search engine pages. Those paid results are part of a shorter term solution called pay-per-click advertising. Pay-per-click-advertising can be a useful addition for companies to receive traffic, but it can be expensive, and once you stop paying for advertising, your website will stop showing up in the paid results. You may already be implementing a pay-per-click campaign and it may be a great solution for your business, but this article will just be covering SEO as it is the only long term solution (and it's free!). Before implementing an SEO strategy, it is important that you have the right tools. Analytics: Use an analytics program such as Google Analytics to track your visitors and your SEO progress. 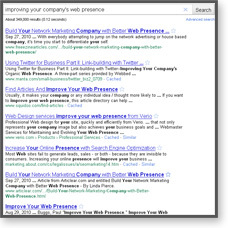 Webmaster Tools: Take advantage of tools made available by Google and Bing to see detailed information about your website including keywords used, links to your site, and how often and deep the search engine bots have visited your site (Bots are intelligent programs made to look at different web content and update the search engine's content. You may want to do some research if you are not familiar). Other Tools: There are various other tools that can make your optimization easier. Some that I use are: the SEOmoz tools, Link Diagnosis, Rank Checker, SEMrush, and the XML Sitemap Generator. These tools analyze links to your site, check your rankings, generate sitemaps, and more. Now that you have the right tools available, here are the steps to take to increase your ranking and increase your traffic. It may take some time, but it will be worth it in the long run. Decide on keywords: The key to SEO is keywords. Keywords are the words typed into a search engine when searching for a web page. Keywords are usually 1-3 words long and describe what the searcher is looking for. When implementing SEO, the first step is to identify what keywords you would like visitors to search for in order to find your website. If you own a label distribution company, you may want to choose the keywords "labels," "thermal labels," "laser labels," and "label supplies." There are several tools that can be used to help come up with keywords. Google AdWords Keyword Tool is the one that I like best. 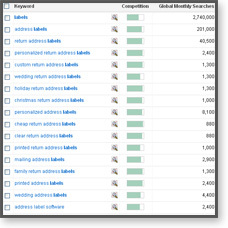 It will tell you the number of searches per month for a given keyword. Target chosen keywords: Once you have chosen your keywords, the next step is to choose which keywords you want to target on each page of your website. In order to get your website to rank on the search engines for any of your keywords, you must use them on your site. If you hope to rank on Google for "label supplies," you have to use that phrase at least once on your website. You should be targeting one or two keyword phrases per page (possibly more on the home page) and each page should target its own keywords. For example, on your home page you may want to target the keywords "label supplies," "laser labels," "thermal labels" and "address labels." On your general products page, you may target "laser labels" and "thermal labels." On your laser label product page, you may target "4x3 laser labels" and "polyester address labels". Notice that as the page gets more specific, the keywords generally get more specific. With the recent unveiling of Google Instant, using longer and more descriptive keywords on your product pages is a must. You can still target general keywords while targeting longer keywords (For example, if you target "4x3 laser labels" on your laser label page, you are still targeting "laser labels" since the keyword is contained within your keyword). This may be confusing, but there are many blogs and articles out there dedicated to SEO that can help you understand better. Title: Include the keyword within the HTML title tags of the page. For example: "<title>4x3 Laser Labels, Polyester Address Labels | Example Label Company</title>"
Meta Description: It is considered good practice to use the keywords in the meta description tag of the page. It may not affect ranking, but it can attract users to the page, since the description will be used on the search engine results page. Body Text: Use the keyword throughout the body text 2 or 3 times, but only where it fits. Also include keywords in headings, image names, image ALT tags, and link text (also known as anchor text). Directories: Directories such as dmoz, business.com, Yahoo directory, BOTW, and others can be a good source for links. They allow you to submit your site and a brief description and they will post a link in their directory. Some downsides are that many directories charge for submissions and some of the free ones are hard to get into. I.D. Images still has not been accepted into the dmoz directory. You can also submit your site to Google Places, Bing Local Listing Center, Yahoo Local, and other local directories. Partner Companies: Ask a partner company or an organization that you belong to to link to you on their website. They may say no, but even a single link from a related company looks good in the eyes of a search engine. Blogs, Articles, and Social Media: This source of links may or may not be worth your time. The only way to get quality links from these sources is to have a quality blog, write quality articles, or have a strong social media presence. People will not link to your blog or article if you do not write quality content and engage with readers. In the same way, people will not retweet your tweets or become Facebook fans unless you have something interesting or new to offer. Press Releases: Submitting a press release to an online press release submission service can be a great way to gain links. Don't overuse this solely for links, as it can get expensive and it may not be a permanent source of links (we submitted a press release and had a few quality links for a couple weeks before they disappeared). Even if you do not gain any links from a press release, it can still be a great way to draw traffic and help promote your brand. That's it! It may seem complicated and a little (or a lot) overwhelming, but take it one step at a time, research parts that you do not understand, and before you know it you will start to see positive developments in your rankings, traffic, and web presence in general. Remember, increasing your rankings and traffic is not an overnight occurrence. It will take time to build rankings and visitors, but it will pay off in new customers and profits in the long run.